Antarctica. The Great White Desert. The Tundra Down Under. The Big Ice Cube. The Cold-tinent. Ol' Snowyface. We've finally made it. Like the polar explorers of old, we've slowly made our way across the stormy seas to our destination. We've seen a lot of amazing things along the way, including endangered wrens in the Falkland Islands and nesting albatross (260 times larger than the wren) on South Georgia and the Sandwich Islands. We've seen adorable seals. And terns. And shags. And weird ducks and caracaras and oystercatchers and geese and vultures and a whole lot of penguins. 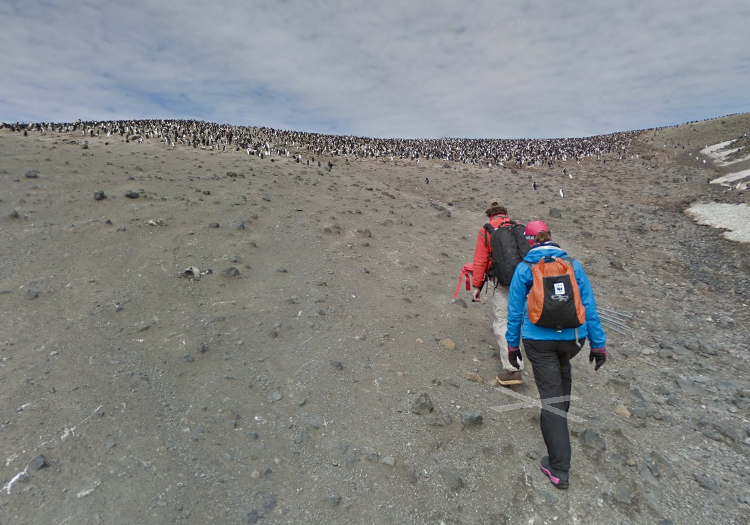 We start - led by our intrepid Google Street View friends - at the Antarctic Peninsula, that long point of land sticking out towards South America. 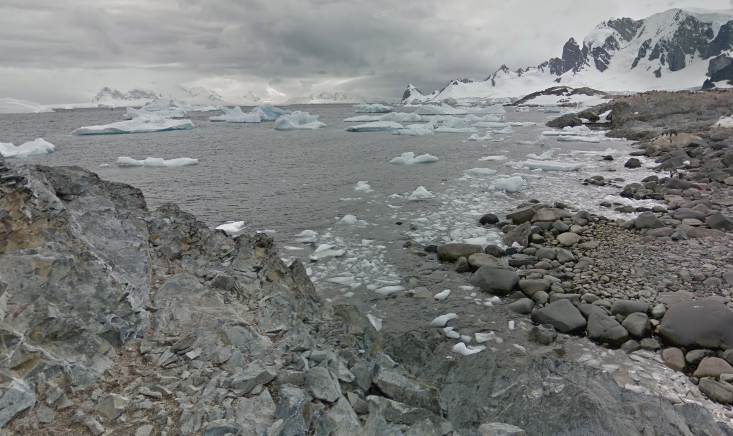 We start on a small outcropping called Half Moon Island, just off the mainland of Antarctica. 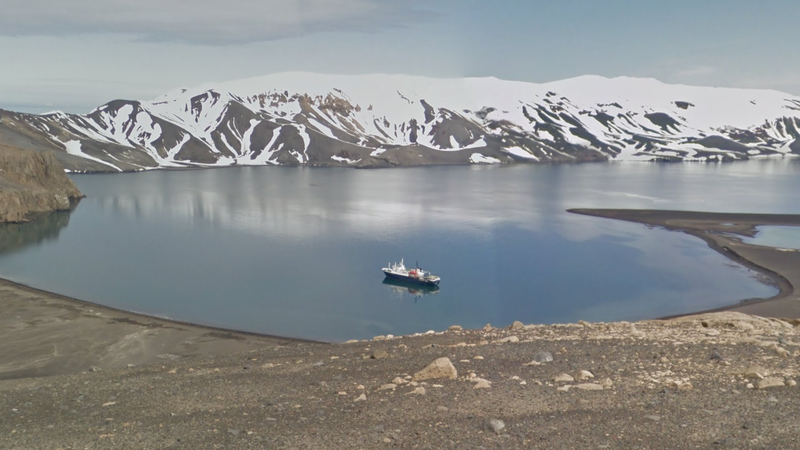 According to the informational overlords at Wikipedia, the 2010 images taken here were the first to put Google Street View on all seven continents. There to welcome them, of course, were penguins. These are chinstrap penguins, named for the stripe running along their throat that looks like that bad haircut worn by the burnout kid in your 1995 high school class. Cool birds down there at the end of the world, but they were all I could find here. We're getting into a part of the world not exactly known for its diversity. The eBird hotspot for Half Moon Island records only 19 species. A Kelp Gull! Has the famous Shrimpy fled the balmy Maryland coast for rural climes? I'd like to think so. What the heck? I'm pretty sure it's a Brown Skua doing calisthenics. A ways up the hill we found some Chinstraps. Thousands of them. NEXT! Let's go further south now, finally onto the mainland of the Antarctic Penninsula, to the not-island of Cuverville Island. It really looks like Antarctica, with iceburgs and stuff. 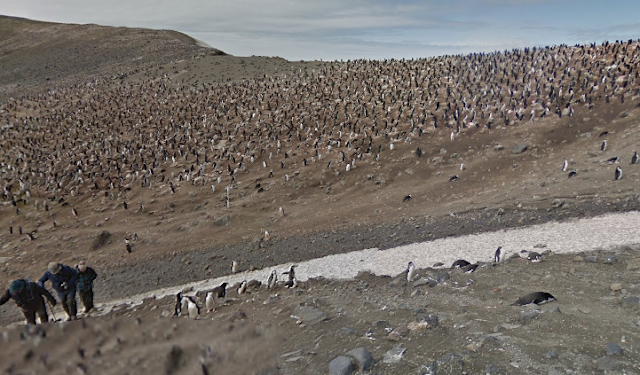 And penguins! This area is home to about 6500 pairs of Gentoo Penguins. Google found them pretty easily. Better sharpness on that last one than most of my personal photos. Hey whose, like, normal-sized sailboat is that? How the hell did they get here? "Honey, I think we took a wrong turn at Martha's Vineyard." And a couple more Brown Skua. I believe that concluded the oceanic voyage these folks were on. 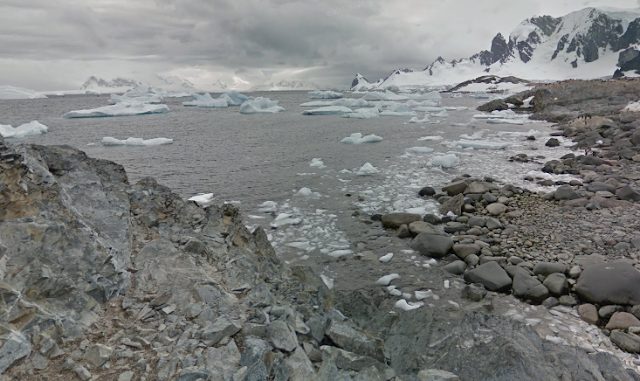 There are no additional Google Street View spots along the Antarctic Peninsula. But GSV isn't done with Antarctica. 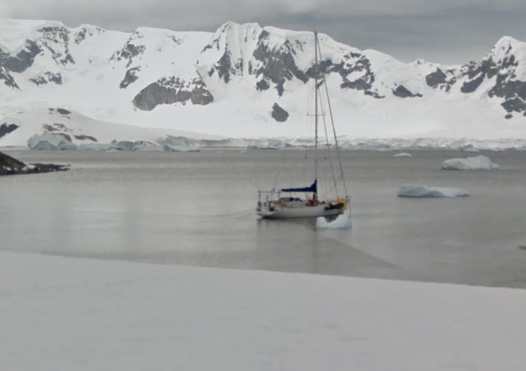 Much further south, along the mainland of the continent, some intrepid someone took the GSV camera to the McMurdo Station. 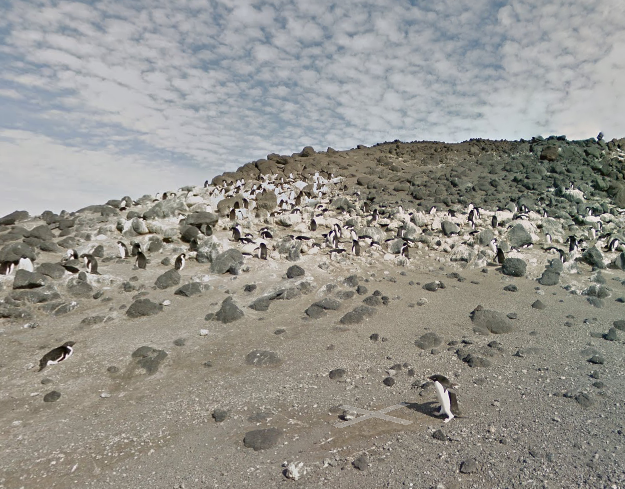 I couldn't find any birds there, but there are a ton of Adelie Penguins at nearby Cape Royds. 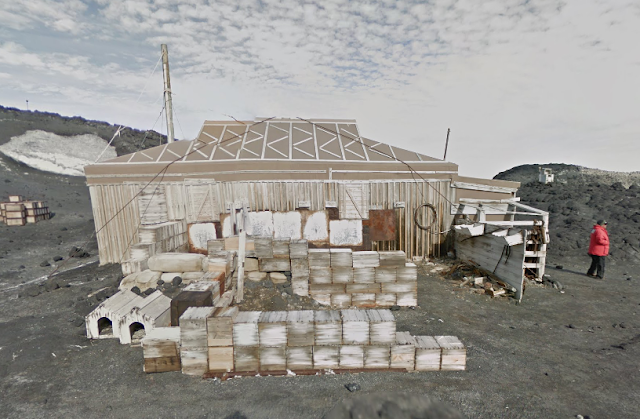 Also out there at Cape Royds is the hut of explorer Ernest Shackleton, built in 1907. It stands out there well-preserved and protected, but utterly alone. It's a monument to man's drive and, perhaps, to his insanity. I feel the same way about this blog post. 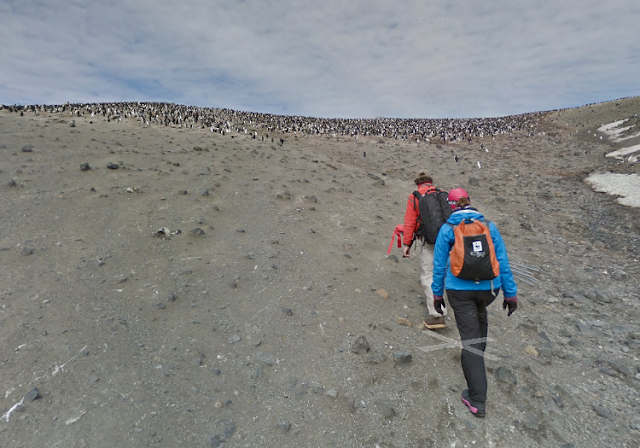 Thank you for joining me on this epic Street View Birding Antarctic Adventure. Now let's all get back to civilization.